Home ParentingBecoming Mom	So this is what they meant…. Silly me. I thought we could bypass the whole 4 month issue with sleeping. What’s that? There’s an issue? It has a name? Why yes, thank you for asking. It’s called the “4 month sleep regression” and it has made its presence known! The first time I ever heard of this beast was on Amy’s blog, which led me to AskMoxie, which pointed me then to Light and Momentary Things. I have a point. Remember when Oscar had that ONE AWESOME WEEK of sleeping? Well, it seems that was all it took for my mind and body to say yippee! We made it! We get to sleep again. Consequently, it was also all it took to get Oscar all rested up for his (weeks long?) sleep strike. We are going on 2 weeks of fitful sleep. It’s always 2 steps forward and one step back I am learning. And that is totally normal. He has had some really good nights -we got a 7 hour stretch a while back. And some not so great nights – last night he was up every 3 hours to eat. 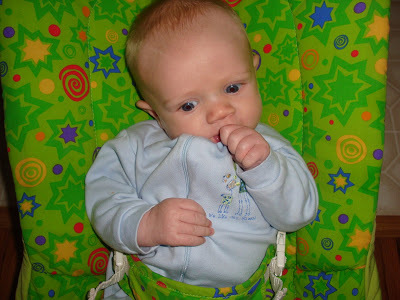 He is also much more distracted when eating despite being a more efficient eater as he gets older. Then it dawned on me. He is 15 weeks old. That’s pretty close to 4 months. And since he has hit just about every growth spurt and milestone about a week or 2 early, it totally makes sense that he could be getting a jump start on regressing. Wait, does that even make sense? Does anything make sense when you aren’t sleeping? Also, if anyone could tell me how it’s possible that the spawn of Jerry and me is early for everything that would be great. Let’s get back to sleeping, er not sleeping. Ok, so I mentioned that I planned to skip this regression. I’ve been reading you know and it seemed that our choice of parenting styles was working. I’ve read a LOT about sleep and parenting philosophies over the past few months and I am going share what we do. It doesn’t mean that everyone should do it. It just means we do it, and I am sharing. The book/philosophy that jives with us is The Secrets of the Baby Whisperer and most recently, The Baby Whisperer Solves All Your Problems both by Traci Hogg and Melinda Blau. Disclaimer: they do not advocate co-sleeping so if that is what works for you, you might want to hold off on this book until you are trying to implement independent sleep in their own bed/crib. I like the basic routine and suggestions for helping a baby fall asleep on his/her own without just leaving them there to cry. I like that there is a certain order to the day, but that it isn’t dependent on a clock. I also like that 9 times out of 10, Oscar wakes up happy, goes to sleep easily and eats really well. For us, it’s about a lot more than sleep. It’s about consistency. I don’t like the term sleep-training because it has been demonized in many circles as “wrong”. But let’s be honest, everything we do is training our children in some way. If we teach them to sleep in a crib, we are “training” them to sleep there and telling them, this is normal. Further, if we teach them to sleep with us in our bed, we are “training” them that co-sleeping is the norm. Either way, the babe is always learning. We chose our path and it had been working so well, that I was convinced I beat the system. BUT, as much as I like my little book, it’s just a book and I have a real live baby. A baby who needs me to be flexible and patient and aware. At this time, I would like to commend anyone who ever had a pre-google baby. I don’t know how I would have survived 🙂 Happy Mother’s Day to you! I am so thankful for the information that is literally at my fingertips 24 hours a day. It blows my mind. So in the past week or so as sleep has been getting progressively worse, and Oscar has been waking during the day 45 minutes into naps and every 3 hours at night, I suddenly remembered all those blogs from the first paragraph. Ahhh….crap! 4 month sleep regression! It found us! So I am back to reading and coping. And from what I can tell, this one doesn’t have a fix. You just deal. I can do that. The good news is, there is a light at the end of the tunnel. There always is, no matter which tunnel you are in. There’s a light and we will find it. Guess what? Oscar is an amazing baby who is growing and developing and learning and loving. I am a mommy who also loves to learn and grow and develop and love. And we are doing it together, sleep or no sleep. OK, your intro cracked me up! And the only thing I can say is, it DOES go away! Eventually you’ll get more sleep and you’ll say man I’m glad that’s over. I’ve heard really good things about Baby Whisperer. I am interested to hear how you like it in the long term. And good point about everything we do being training. It’s weird how certain words have an intense connotation. Like I hate “schedule” but “routine” is fine. Really?